Why do people make the difference? If you think of any experience, whether good or bad, it is usually influenced because of how a person acted, reacted or behaved. Think about it. For instance, the first time you flew with food allergies and the experience was wonderful. It was probably due to how someone treated you. How about when you dropped off your food allergic kid at kindergarten? That experience was made so much the better because of the reception you received at the school. Another example, could simply be how the parking attendant barked at you on how to park your car. The truth is our action or others’ action affect us all day long. This is what stayed with me the most after the Gluten Free and Allergy Free Event in Raleigh. The people are what make our industry great. Whether it be the behind the scene show organizers, the vendors, or you the customers! Everyone has a story. 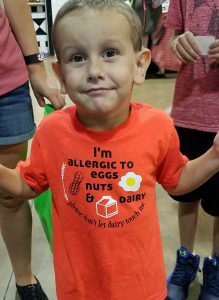 Everyone has a deeper reason to be in the food allergy community. Please allow me to share some of these remarkable stories with you. First, there’s Jessica*, who has a severe allergy to morphine. She, of course, found this out the hard way. Jessica was given morphine in a hospital and had a reaction. She stopped breathing and was given a lot of Benadryl. Jessica fell into a coma. When she finally came to, the doctors told her she was very lucky and that the next time she would not be. 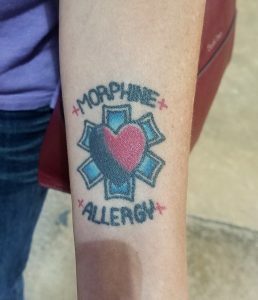 Because her allergy was so severe, her sister-in-law who is a nurse, recommended that she get a tattoo showcasing her allergy on her wrist. This way, no matter what happens no one will ever give her morphine again. I had the privilege of hearing many stories. Many of them were quite personal. People were confiding in me their deepest fears. They were also asking my advice or specifically coming to the show to see me present on traveling with food allergies. All this was terribly humbling and rewarding. It was a great reminder as to why I do what I do. Nikki and Doodle! Allergic Traveler has been doing this show for many years. We return year over year because of the people, but we would not if Nikki was not doing a fantastic job running the show. Nikki also runs a blog, which can be read here. 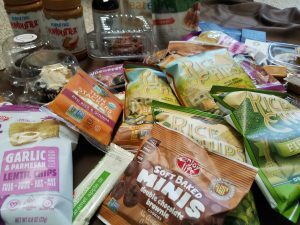 She travels the U.S setting up events for allergen-free living. On most trips, her teenage daughter, Erin a.k.a. “Doodle”, goes along. They have been planning these events since Erin was diagnosed with Celiac Disease in 2008. There were so many vendors there. Some were national companies others were local companies. They all had a story. 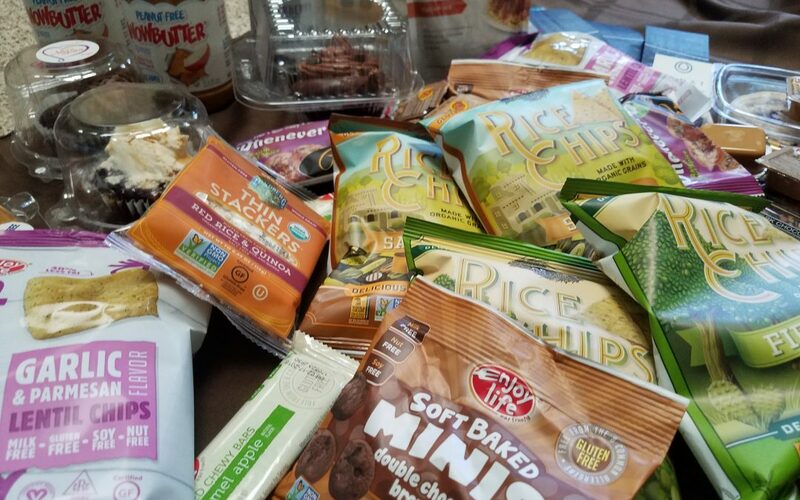 Nearly all were introducing new allergy friendly products. Take a peak at who I had the opportunity to meet. Simply Crepes – who has a gluten free menu and does catering. Patton’s Pride – Gluten free, corn meal and corn flour breading. They ship nationwide. Patton’s Pride has more than 30 years of southern recipe. JPs Pastries – Gluten free, egg free and soy free baked goods. They carry cakes, donuts, granola. You can order online or find them at Whole Foods. Ada’s Cupcakes – All her cupcakes are free of the top 8 and made with organic ingredients. The cupcakes are delicious and moist. They are only available in the triangle and with special delivery. Kind Snacks – New product “Pressed” It is 6 fruits that are dried and pressed, sort of like fruit leather but more fruit concentrated. Sara B – Wheat, soy, dairy free donuts are there best-selling items. With the fall coming their best-selling item is coming up, pumpkin spice donuts. I am Celiac – Offers cook books with easy to make gluten free recipes for families that are always on the go. 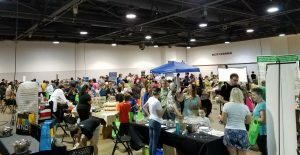 The Gluten Free and Grain Free Gourmet – She can be found at Farmer’s markets across Ohio and The Gluten Free and Allergy Free Events across the states. Her raspberry cookie is my favorite or even just her icing. There were many more vendors there sharing their goodies and their stories. I wish I had the time to meet everyone. With all the people, it was hard to sample everything. I guess I will need to go back next year! What was your favorite treat? What was your favorite story that you heard.